The keynote address, Music, Activism, and Social Change: The Possibilities of Undergraduate Research will be given by Jennifer Kyker, Assistant Professor of Music and Ethnomusicology. A former Fulbright Scholar, Professor Kyker has researched audience reception of postcolonial Zimbabwean popular music and has studied the mbira, an instrument played at various rituals in Zimbabwe. She is also the founder of the nonprofit organization Tariro, which works to educate and empower teenaged girls in Zimbabwean communities affected by HIV/AIDS. 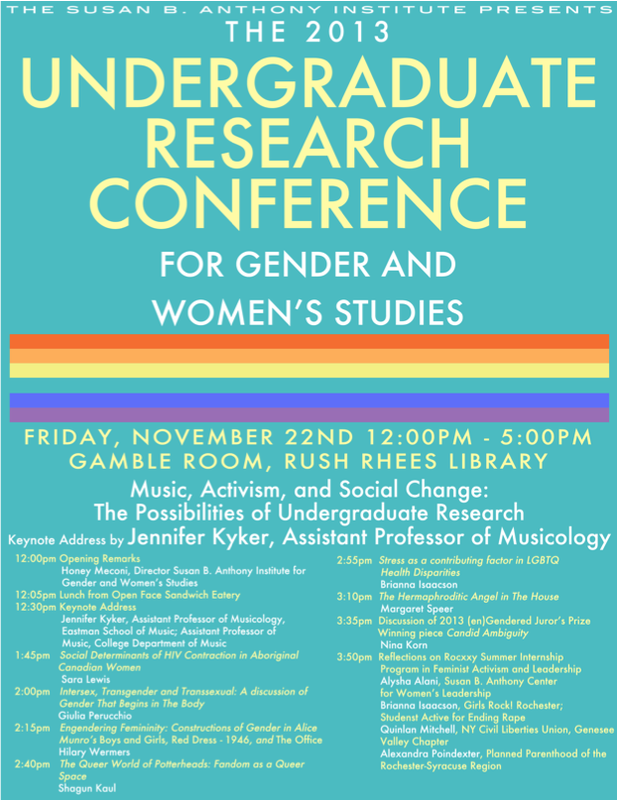 The conference is free and runs from 12:00 pm to 5:00 pm tomorrow, 11/22, in the Gamble Room of Rush Rhees Library. Lunch from Open Face Sandwich Eatery will be provided at 12:05, preceding the keynote address. We hope to see you there! This entry was posted in Announcements, College Events, SBAI Events, UR Events and tagged #(en)gendered, #jenniferkyker, #research, #rocxxy, #undergraduateconference, #UndergraduateResearch. Bookmark the permalink.